In 2009, three Texas winemakers – Pat Brennan of Brennan Vineyards, Gene Estes of Lost Oak Winery, and Kim McPherson of McPherson Cellars – began exploring the idea of opening a winery in Fredericksburg, the heart of Texas wine country. 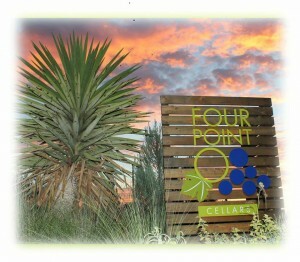 As a result of their collaboration, 4.0 Cellars opened its doors in April 2012. In addition to being the fourth winery in this prestigious group, our name highlights the group’s goal to consistently reach 4.0 perfection in our winemaking and customer service. Gene Estes, founder, president, and grape grower at Lost Oak Winery near Burleson, Texas, began his winemaking career in 1963 in his family’s garage. The result was an explosion of Concord grape juice. But after years of determined focus and education in the U.S. and France, he perfected both his grape growing and winemaking skills, and in 1999, he produced his first real wine from estate-grown Vinifera grapes. Today, Gene assists Lost Oak’s winemaker, Jim Evans, with winemaking. Jim has been harvesting grapes and making wine in Texas since 1981. He began his career in the University of Texas Experimental Viticulture and Enology program and moved to Lost Oak Winery in 1999. Lost Oak Winery quickly made its mark producing high-quality Texas wines, earning prestigious awards for its Merlot. The McPherson family has been a leader in Texas grape growing and winemaking for over 40 years. Dr. Clinton “Doc” McPherson is considered one of the “fathers” of the modern Texas wine industry, and he and his son Kim were inducted into the Who’s Who in Food and Wine in Texas Hall of Fame in 1999. In 1976, Doc, a chemsitry professor at Texas Tech University, along with horticulture professor Bob Reed, founded Llano Estacado Winery, the first post-Porhibition winery in Texas. It’s sais that some of the first modern Texas wines were created in the basement of the chemistry building at Texas Tech. The McPherson Cellars label was created in 2000 to honor Doc McPherson, and today Kim carries on the McPherson tradition of producing award-winning Texas wines. Kim’s focus is on the “terroir” that Texas provides for grapes and on ensuring that grape growers select and grow varietals that fit with our soil and climate. McPherson Cellars promotes Medeterranean and Thone Valley varietals that are well suited to Texas.